Muslims and Jews, normally not allies, have banded together to ask the German parliament to overrule the court ban on circumcision. Muslims and Jews, normally not the best of friends, have banded together to ask the German parliament to overrule the court ban on circumcision. There are approximately 4 million Muslims and 150,000 Jews living in Germany. Jewish law requires that new-born boys be circumcised when they are eight days old, unless medical reasons force a postponement. Muslim law also requires circumcision, which the forefather Avraham performed on himself and his two sons. Ishmael, from whom Muslims consider themselves descendants, was born by Hagar, the maid servant to Abraham’s wife Sarah, who bore Yitzchak (Isaac). 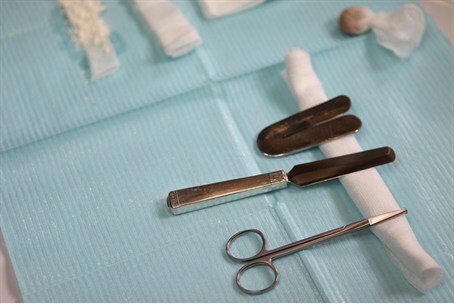 The European Jewish Press reported that the statement added, “Circumcision is an ancient ritual that is fundamental to our individual faiths and we protest in the strongest possible terms this court ruling. We will vigorously defend our right to maintain our mutual tradition. "Circumcision flies in the face of persecution of Jews, such as the Holocaust – which is why it makes it even more shocking that it is a German court inflicting the ban,” Rabbinical Center of Europe Rabbi Yitzhak Shochet said at the meeting. On the Muslim side, Imam Mustafa Katstit of the Islamic Center in Brussels declared, “A one-off accident shouldn’t call a long-time tradition into doubt.” He was referring to the court case, which involved a four-year-old Muslim boy who was hospitalized for excessive bleeding after a circumcision. Dr, Igor Byshki, an urologist from Cologne, noted that circumcision “is the most common operation worldwide, with 25-33 percent of global population being circumcised. "World medical organizations have repeatedly reported that circumcision protects against serious infection, such as AIDS."